Lyle: Music is divided up into measures or bars. Each bar can have 4 beats, which is called common time or 4/4 time. Sometimes the bars will have 3 beats, or 3/4 time. There are several other configurations of time. Tonight we will focus on 4/4 time. Think of a bar as an inch on a ruler. That inch can be divided many ways, in quarters, eights, sixteenths and thirds. Lyle: Inside that inch, think of each quarter inch as one beat in the bar. 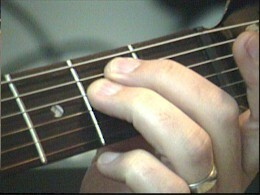 As a basic rule to follow, you'll strum down on each beat, called the "downbeat". Let's use an Em chord for the following strum patterns. Lyle: Here is an example of a basic strum pattern. Strum down for each beat. Try to tap your foot and count out loud at the same time of each strum. Doug: How much time is 1 bar ? Lyle: Doug, 1 bar = 4 beats. Lyle: Now add an upbeat at the end of the bar, right after the 4th beat. Just like taking the last quarter inch on the ruler and dividing it in half. You strum down for the downbeats, up for the up beats. Lyle: When you strum up, angle your pick so it glides over the strings and doesn't get "stuck" in them. Lyle: Each of these strum patterns has a jam track to go with them. They are all the same "groove", just the rhythm guitar in the jam track has been changed to go along with each new pattern. Pete: What kind of pick should I use? Lyle: Pete, medium to heavy for a strong and full sound. Lyle: Now add another upbeat after beat 3. Lyle: Now add another upbeat after beat 2. This is a common strum pattern. Beat 1 is all by itself, while beat 2, 3, and 4 all have upbeats with them. This helps put the emphasis on beat 1, the most important beat in the measure. Lyle: Add one more upbeat after beat 1 and you'll have a full measure of downbeats and upbeats. Lyle: This next pattern divides up the bar with upbeats after the 2nd and 4th beats only. Lyle: This next pattern is a very common strum pattern. It works well with most songs, yet, it can be a tricky one. The hard part about this pattern is beat 3. 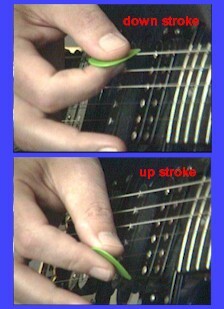 You'll move your pick hand down for beat 3, but don't hit the strings. Then you'll strum up for the upbeat of beat 3 and follow through. 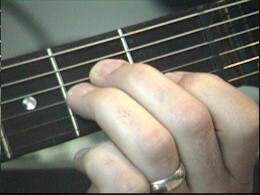 Watch the video and you'll see how my strumming hand keeps a steady down and up throughout the pattern. Count out loud and tap your foot while you learn new rhythms. It helps you focus your attention. Lyle: The next jam track is 4 bars long and uses these 3 chords: Em, Am, and B7. Each chord gets 1 bar to make up a 4 bar progression. The progression is: Em-Am-Em-B7. 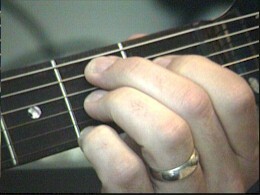 Lyle: Practice any of the 7 different strum patterns you've learned above to this chord progression. Lyle: Here's a sample of me playing pattern 3 with this chord progression. Lyle: Here's a sample of me playing pattern 7 to the chord progression. Lyle: Like I stated before, take some of these simple patterns and learn how to tap your foot to each downbeat/downstrum and count out loud. Lyle: If you played the media in the tab files, you would have heard me counting along with the beats. Lyle: Sometimes I've had to work on complex rhythms and being able to "count through" them helped me understand what I was trying to do.